The Classica Pram comes with a coordinating diaper bag. Designed with artisan craftsmanship using superior quality materials, this pram features a genuine leather handle, exquisite Italian hand embroidery and a handcrafted wooden bassinet with intricate lace privacy curtains. The pram bassinet may be removed from the chassis and replaced with the optional Classica Stroller Seat when your child is older, allowing for prolonged use of this elegant pram. 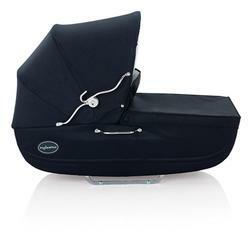 Protect your baby from the elements with the Inglesina Raincover! It's a perfect fit for your gorgeous Classica Pram.